Did you just move into a new home and can't think of how to decorate your rooms? Perhaps you're missing that extra piece of style to make a room complete? A rug can do wonders for the ambiance and feel of a room. 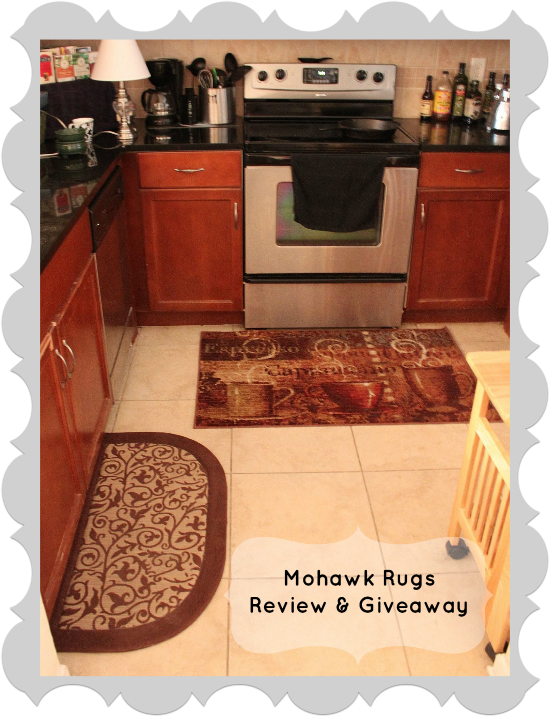 When we had the opportunity to review for Mohawk rugs, I was very excited. Several of my rooms were begging for rugs. Especially the kitchen. Once I plopped these puppies down, they transformed my kitchen! I could really use a rug in our living room, so if i won thats where it would go. I will put my rug in the living room. I would put this in my kitchen. Much like the one pictured, mine is small as well, with linoleum, so a nice rug would make a huge difference! It would be a perfect size for my kitchen. In my living room where I'm at most of the time so I can enjoy it! I need one for my livingroom badly! I'd love to put a new rug in our home office, which right now is sadly pretty bare and in need of a little jazzing up! I would like to put the rug in the front hall by the door. By my patio door where the dogs go in and out and the garage entry where the humans go in and out. Need to get rugs before the snow hits that is for sure, thanks for the giveaway and info. I would put the rug in my kitchen. I would put it in my dinning room! Thanks for the giveaway…we need a new rug for our home office / den !